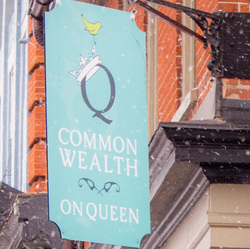 Welcome to Commonwealth on Queen! We are a ‘farm to fork’ cafe featuring breakfast, lunch, and sweet treats made daily! We also offer locally roasted coffee from The Gerhart Coffee Co.,and hand blended, fair-trade, organic Pure Blend teas. We are a BYOB establishment!